In today’s journey through the Albuquerque Morning Journal dated November 5, 1912 , from Albuquerque, New Mexico, I found that it was the day of the Presidential elections with the three candidates, Democratic Woodrow Wilson, Republican William Taft and Progressive Theodore Roosevelt, campaigning to the last minute. This issue contains different articles pertaining to the election. 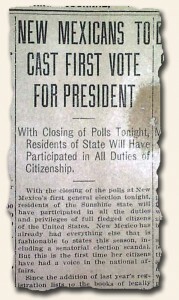 Also within the issue is an article: “New Mexicans To Cast First Vote For President”… “With Closing of Polls Tonight Residents of State Will Have participate In All Duties of Citizenship”. This election would be the very first presidential election for the residents of New Mexico to participate in as they had entered as the forty-seventh state on January 6, 1912. Great to have this report within a newspaper from New Mexico.